This archive contains reports and historical data managed by the previous Program Manager (Honeywell) which is no longer updated on a regular basis but is available for reference. Note: Due to file size considerations, beginning with the RY2010 trading period the data is provided in multiple csv files. 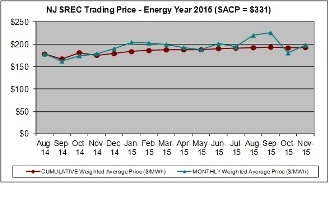 The table below contain monthly New Jersey SREC pricing data based on prices reported by registered SREC account holders. This data is provided for informational purposes only. Past SREC pricing is not predictive of future values, and any persons considering investment in the solar market should perform their independent due diligence. Effective with 2011 reporting, the terminology of Reporting Year was changed to Energy Year to be consistent with The Solar Energy Advancement and Fair Competition Act (A3520). The tables that cover periods prior to the legislative change will continue to be referred to as Reporting Years. For SRECs from electricity produced June 1, 2014 – May 31, 2015. Note 1: The Active kW DC data is based upon generators that have registered their NJ Solar generating facility at PJM GATS as of the end of the month. Additional projects that are installed but have not yet registered are not included in the values shown above.